Manchester United are reportedly willing to extend the contracts of eight members of the current squad, including French winger Anthony Martial. Jose Mourinho’s men have started the new Premier League season poorly, losing two of their opening four games to slip six points behind the frontrunners in the race for the title. Brazilian midfielder Fred, Portuguese full-back Diogo Dalot and backup goalkeeper Lee Grant were the only new signings the club managed to bring in over the summer, as Mourinho failed to land several transfer targets before the window closed in August. 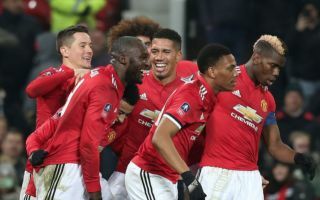 However, club officials are keen to tie down several players in the current squad to new deals, despite the team’s indifferent form so far domestically – as The Manchester Evening News reports. David De Gea, Antonio Valencia, Phil Jones, Chris Smalling and Matteo Darmian all have just one year remaining on their current contracts with Man United, along with Anthony Martial, Andreas Pereira and James Wilson – as per MEN. According to BBC Sport, 22-year-old winger Martial had been linked with a move away from Old Trafford this summer after his agent claimed the Frenchman was disillusioned in his current role at the club and wanted to move on to pastures new, but he ultimately remained in Manchester despite the speculation. Additionally, Darmian was given the green light to leave the club at the end of last season, but his performances in pre-season impressed Mourinho and senior officials enough to warrant a stay of execution for the time being, as MEN also reports. The biggest boost for supporters after this latest news will surely be that De Gea is being lined up for an extension, considering the fact that the Spain international has been the best goalkeeper in England and arguably Europe for the last few years. The Red Devils have been in dire need of some good news and if the players in question do indeed pledge their futures to the club for a little while longer, fans will surely be hoping that the teams fortunes on the pitch can improve as a result, with Watford next up for United at Vicarage Road on Saturday.